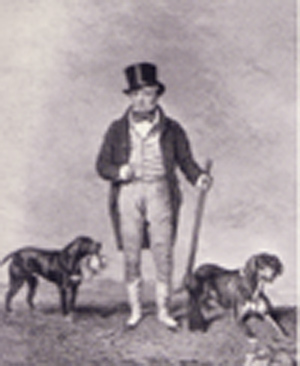 One of the more colourful characters to live in Thurgarton Priory, from 1813 to 1815, was Squire George Osbaldeston who in his heyday was lionised as the best shot, cricketer, horse rider and sportsman in England. We know this partly from his autobiography for the squire did not suffer from false modesty. Early life He was born in 1786 into a wealthy Yorkshire family who lived at Osbaldeston House near Scarborough. His father was M.P. for the town but died when George was six. As the only son amongst five children, he inherited a vast fortune. Aided by an extravagant and indulgent mother, he spent the next few decades in the usual pastimes of an English gentleman – sport and drinking, at which he excelled, and gambling and women, at which he didn’t. His education was the perfect preparation for such a lifestyle. After expulsion from Eton and a ‘wild spell at Brighton’ he narrowly escaped being sent down from Brasenose College Oxford emerging three years later without a degree. 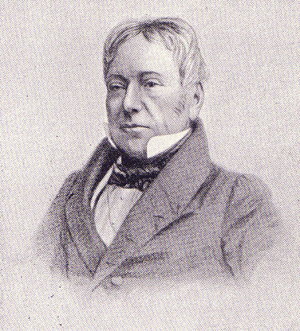 His mother pushed him into politics and in 1812 he was elected the Whig MP for East Retford; he rarely attended Parliament for he found politics ‘ a great bore’ and stepped down at the next election in 1816 to concentrate on his great love – the sporting life. Cricket Undoubtedly Osbaldeston was a gifted sportsman but his personality often attracted disputation.He played for the MCC, Surrey and Sussex and being both a gifted fast bowler and batsman enjoyed single wicket competitions that invariably involved large side bets. In 1810 Osbaldeston teamed up with the professional Lambert and played Lord Frederick Beauclerk and Thomas Howard. The squire fell ill and withdrew from the match but his opponents insisted it must proceed. Lambert deliberately bowled wide and to Beauclerk’s fury won by 15 runs. As a direct result the MCC changed the rules of cricket to ban bowling wides. Ill feeling flared again in 1817 when Beauclerk captained an England team against a Nottingham eleven which included Osbaldeston and Lambert. Both sides accused the other of cheating and such was Beauclerk’s influence that he had Lambert banned from the MCC. The following year Osbaldeston was so enraged by losing a single wicket game to George Brown of Sussex that he resigned his MCC membership. Later he relented and reapplied for membership only to be barred by the vengeful Beauclerk. The Horses A physically tough slightly built man he was for many years a gentleman jockey riding his own race horses. Inspired by the famous exploit of the 17th century highwayman ‘Swift Nick’ Nevison, who rode from London to York in 15 hours, Osbaldeston wagered 1000 Guineas that he could ride 200 miles within 10 hours. The race was held at Newmarket racecourse on a wet November day in 1831. The squire, dressed in purple silks and black velvet cap, set off at 7.12 am. and despite several rain showers, one fall and generous stops for brandy and food, achieved the 200 miles in less than 9 hours riding 28 horses. He then rode back to Newmarket, bathed and joined his friends for dinner. 162 years later on the same course, Peter Scudamore the champion jockey only just managed to beat the squire’s record although his breaks were much shorter and he spent more time in the saddle. On completing the 200 miles Scudamore declared himself exhausted and ‘laid himself carefully on the ground for a massage’. In 1836 the squire was suspected of deliberatly holding back his horse Rush at Doncaster so achieving a favourable handicap for the following race meet at Heaton where he won easily. He had of course backed himself heavily at Heaton including a £200 bet with Lord George Bentinck. His lordship was slow to settle and when Osbaldeston demanded his winnings Lord George declared “ I’m surprised you ask for the money for the affair was robbery’. Accused of cheating Osbaldeston demanded satisafction and so the Squire and the Lord met at dawn, pistols drawn, on Wormwood Scrubs. Unlike his opponent Osbaldeston was a crack shot but his lordship’s friends had seemingly negotiated a compromise and both parties missed their mark. Hunting was the squire’s other great passion and for nearly 30 years he spent a fortune moving from one famous hunt to another: 1810 the Burton, Lincolnshire; 1813 the Muster’s pack (now the South Notts); 1815 the Meynall and Atherstone, Derbyshire; 1817-24 and 1823-27 the Quorn, Leicestershire; 1827-34 the Pytchley, Northants. Each move involved the enormous expense of purchasing the Mastership which included the running costs of stables, kennels and men and renting a gentleman’s residence for the season. During his time in Nottinghamshire (1813-5) he rented Thurgarton Priory -“Thurgarton was a pretty good house but I was obliged to build stables as well as kennels , a very expensive business”. However Osbaldeston was not impressed by the hunting, describing the countryside as“very bad and inconvenient for hunting, as the River Trent is so wide and deep that hounds and horses must be taken over in a boat.” During his time at Thurgarton the squire was bitten by a hound that might have been rabid: “he was seperated from the pack and I watched him daily (for a year) with the greatest anxiety convinced that if he did go mad I must die of that horrible disorder, hydrophobia”. The squire’s success at hunting the fox was not mirrored in his pursuit of women. When in Lincolnshire he vigorously courted the recently widowed Lady Munson but she went to ground and married Lord Warwick. A Miss Green of Lincoln provided some comfort but she quietly left the country on the birth of a son reputed to be the squire’s. At one county ball he was said to have seduced both the daughters of the house in one evening. True or not such stories about the squire’s hunting exploits on and off the field only fed his reputation and no doubt grew in the telling. More certain are accounts of his petulance and short temper that led to numerous disputes and to his frequent change of hunts. 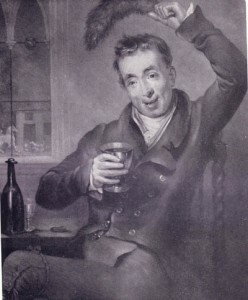 Osbaldeston’s lifestyle especially his gambling eventually exhausted even his considerable fortune. Overall he lost about £200,000 on horses and in 1848, to settle debts of £167,000, he sold his estates for £190,000 and an annuity of £10,500 pa for life. In such reduced circumstances in 1851 aged 65 he married a rich widow, Elizabeth Williams, and lived in her house in Regent’s Park until his death in 1866. All the major newspapers of 1866 printed lengthy obituaries of “The Squire of England” celebrating his many feats of sportsmanship but mixed into this praise of a legend were more bitter memories and accusations of ungentlemanly conduct. Squire George Osbaldeston belongs to the pages of Henry Fielding’s novel Tom Jones but he lacked that hero’s charm and generosity – there was too much of the snappy Yorkshire terrier in him. We found this very interesting. No doubt every part of England has a similar colourful character. Here in Shropshire it is “Mad Jack Mytton”. His history can be found by googling Jack Mytton. His cure for hiccups is interesting, and was apparently very amusing to his friends. It involved setting fire to his shirt! What a hoot. I am a great-great-great-great grand-daughter of The Squire, via the child who was borne to Miss Green who “quietly left the country”! Well, she quietly left to go to Tasmania. Her son George Osbaldeston Green, in married a woman named Mary Ann Heastwood (b Yorkshire 1819). She lived to a decent age, and allegedly they travelled back to England for visits, even after leaving Tasmania for Victoria. They had 15 children (many of whom died in infancy or childhood), but nevertheless ‘The Squire’ had quite a group of grandchildren!! One of his grandchildren, also named George – surname Green, so they had their unmarried mother’s name (with Osbaldeston as a middle name) married a woman from Germany, Dorothea Lenz.. They in turn had 5 children, all of whom had offspring. My great grandmother, Amelia Green, married Joseph Henry Pearson, they had my grandmother, Ella, who married Percy Smith, and they had my mother. So….here I am researching my family history, and after 20 years of pondering where this strange name that poopped up in birth certificates ‘Osbaldeston’ came from, I have finally, with the power of the internet and ancestry.com found the answer. What a colourful antecedent to have discovered! Os/ chief or god / Balder/son of Wodin / ton / stand of trees or a village. I am the current owner of the priory and have lived there for more than 20 years. It is a most wonderful place and we would be very pleased to see you here some time for a cup of tea in the good old English way. I know that The Squire is descended from Mitfords….what relationship did he have to the famous Mitford women writers?